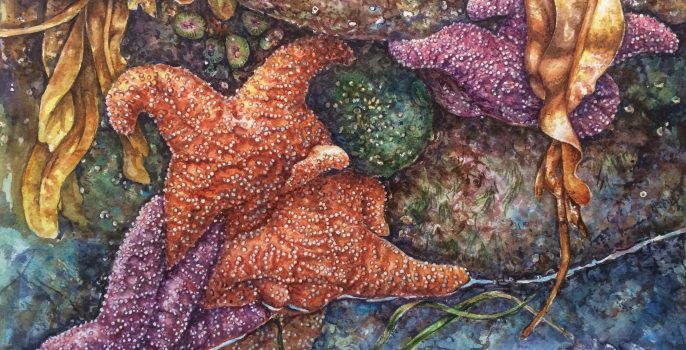 This watercolour image is inspired by a visit to the west coast of Haida Gwaii. 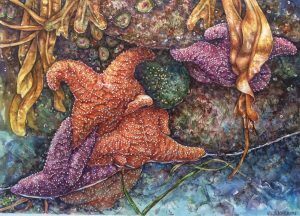 It depicts the interconnection between animal and plant and the interesting transition from high tide to low. Tidal creatures adapt to this constant change and the seconds of transition are fascinating. By sitting and observing, one experiences a meditative moment when time is measured by the dropping water level.